When we produced Volume 20 Shap’s Steam Twilight, we advertised it with only Britannia’s, Black 5′s, Standards and 8F’s, all at the end of steam over this famous incline. It has been one of our best sellers over the years and now it is time to produce another version filling in the gaps in the story as more well taken views have come to us. This video does include all the previous types of locomotive but here there is the odd Duchess, Clan, Royal Scot and the 2-6-4 Tanks which banked on Shap before the Standard Class 4′s. 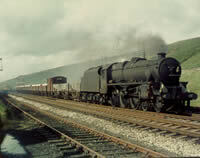 Instead of Crewe as a starting point we begin at Lancaster and visit the Arnside line and Windermere branch. There is more action on Grayrigg than before. Excellent action on the troughs of Hest Bank and Dillicar. We had to include yet another cab ride on a Shap banker. Shed scenes at Tebay and Carnforth provide nostalgic viewing as engines are prepared for the struggles over the one thousand foot summit of Shap. One Britannia really struggles as it is brought to a stand at Scout Green in a westerly gale! A double header out of the loop at Tebay was not staged but the crews entered into the spirit of things for the cameraman. Thirteen cameramen provided the film for this production. The men who worked this railway are seen at work, the grime and the glory of what was Shap, even a cow could almost disrupt the West Coast Main Line traffic! Sit back and enjoy this one if nothing else, taken on 8mm & 16mm film with authentic sounds taken at the time for your enjoyment.